Greater Madison is made up of eclectic neighborhoods, each with its own style and personality. Keep reading to discover each area’s unique attributes and start planning a stay in your favorite neighborhood today! Labeled as Madison’s “first suburb,” this neighborhood is now considered close to downtown. Many University of Wisconsin-Madison professors call this area home, and their influence keeps the shops and restaurants quaint and friendly. Families love the admission-free Henry Vilas Park Zoo and residents stay active by utilizing the UW-Madison Arboretum and Lake Wingra. For a Piece of History: Visit Camp Randall on the University of Wisconsin-Madison campus. There are so many unique and important iconic places along Monroe Street but Camp Randall has been around the longest. Home to the UW-Madison Badger football team since 1917, the stadium also hosted the state fair before the Civil War. Once the war started, Camp Randall housed troops, with more than 70,000 men attending training drills at the complex. The creative Atwood Avenue neighborhood has transformed from a blue-collar district into a hip and vibrant community. Many consider this east-side neighborhood one of Madison’s most innovative due to its numerous funky shops, ethnic restaurants and cultural opportunities. For a Slice of Heaven: Visit Gail Ambrosius for deliciously exotic, hand-crafted fine chocolates inspired by the finest, freshest ingredients. When in the Atwood neighborhood, be sure to stop-by her shop and sample the truffles, caramels and seasonal chocolates (you’ll discover why Gail was named one of the top ten chocolatiers in North America by Dessert Professional Magazine). The Williamson-Marquette neighborhood, affectionately known just as “Willy Street,” was the first in Madison to form a neighborhood association in 1959 and continues to preserve its eclectic heritage thanks to its independent-minded residents. The neighborhood is a haven for foodies, with restaurants featuring everything from Laotian to Cajun. Locals love the local music scene on Willy Street and summertime brings many music festivals. For a Bit of Nostalgia: Step into Hotel Ruby Marie, Madison’s oldest operating hotel. It is now a bed and breakfast with one of the best views of Lake Monona, and it hosts a piece of history along with a complimentary breakfast and happy hour. 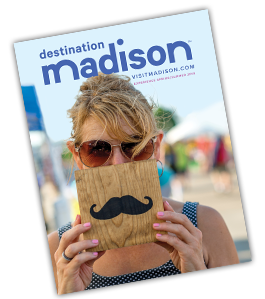 More than an entertainment district, downtown Madison is a lifestyle district, encompassing dining, culture and nightlife. Five areas combine to form Madison’s oldest neighborhood, and its main objective is to preserve a viable and vibrant downtown. With State Capitol building, numerous museums, award-winning restaurants, live music and local shops, the downtown area of Madison is a mecca for anyone craving city life. For a Piece of History: Climb the steps of the Capitol Building. Reaching to a height of more than 265 feet (three feet shorter than the nation’s capital building), the Capitol dome is topped by the elegant gilded bronze statue “Wisconsin.” Inside, a mural lavishly decorates the interior dome of the rotunda, the only granite dome in the United States. Tour the building—don’t forget the sixth floor’s observatory deck, which gives a breathtaking view of Madison. Johnson Street is experiencing an unprecedented boom, with creative new shops and restaurants moving in. Empty retail space is being bought by innovative new companies, merging with Madison’s experienced anchor businesses that have been around for 25 years or more. The neighborhood brings a fun vibe and an unintimidating feel, where doors are open for all visitors and residents. For a Piece of Peace: Visit Tenney Park, which is like a picture out of a storybook. The park has winding paths, views of Lake Mendota and five picturesque bridges. It may be even more beautiful come winter, when ice skaters glide on the frozen lake and the snow-white trees reflect on the ice. The park was designed by nationally known landscape architect Ossian Cole Simonds, and is an intact example of the Prairie School of landscape architecture.